Soap making is a great hobby to learn. The process of making soap can be a lot of fun, and when you're finished you'll have soap that you can use at home, give as gifts, or possibly even sell. Making soap isn't a difficult process, and there are many different ways you can go about creating your handmade bars. The LoveToKnow Crafts soap making category is filled with helpful tips and how-to articles to help you master this enjoyable activity. There are several different ways to make soap. Try making soap without lye to get started, and use instructions for making your own molds to create truly unique shapes and designs. You can also learn about techniques for no-cook and melt and pour options. Try various methods for a variety of finished bars and liquid soaps. 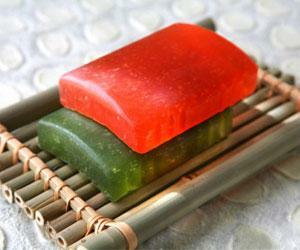 Browse recipes for a variety of different types of soap. You can get instructions for making your own soaps with olive oil, oatmeal, beeswax and much more. Then branch out and create an entire line of complementary products, including bath salts and body lotions. Of course, making your own soap requires materials and supplies. Learn about supply catalogs where you can find the items you need for your hobby, as well as tips for finding used soap making equipment. Let LoveToKnow Crafts be your go-to resource any time you want to learn more about the art of making soap. Whether you're looking for instructions, information on starting your own soap business or information about classes that can help you further develop your soap making skills, you'll likely find what you're looking for here.